Looking for a simple weeknight dinner? 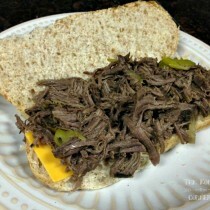 This Italian Beef made in the Crock Pot is really easy to throw together in the morning, and it's ready when you get home! Add in seasonings and cook on Low 8 hours. When finished cooking, take meat out and shred with 2 forks. Place shredded meat back in Crock Pot and cook 20 minutes longer. *If you like it spicy you can add in more peppers or juice to taste. I generally buy the 12 oz jar and use 1/2-3/4 of the juice and peppers.